Amongst the services public libraries provide for children across the nation and in Colorado (such as storytimes, homework and reference assistance, computer access, and readers’ advisory services), summer reading programs in particular give young people support and encouragement to read books and engage with public library services during traditional “school vacation” months. When promoted to the public, summer reading programs typically espouse reading for fun and pleasure. Within the library and education communities, ongoing and past research studies also address the impact of summer reading as a means to enhance the development and retention of children’s reading skills. This report focuses on statistics about summer reading programs in Colorado libraries. Further, it elucidates the role of the Colorado State Library (CSL) in promoting, implementing, underwriting, and evaluating such programs. National Center for Education Statistics reports covering research from 1988-19891 and 1993-19942 show 95 percent of America’s public libraries offered summer reading programs for children during both those time frames. 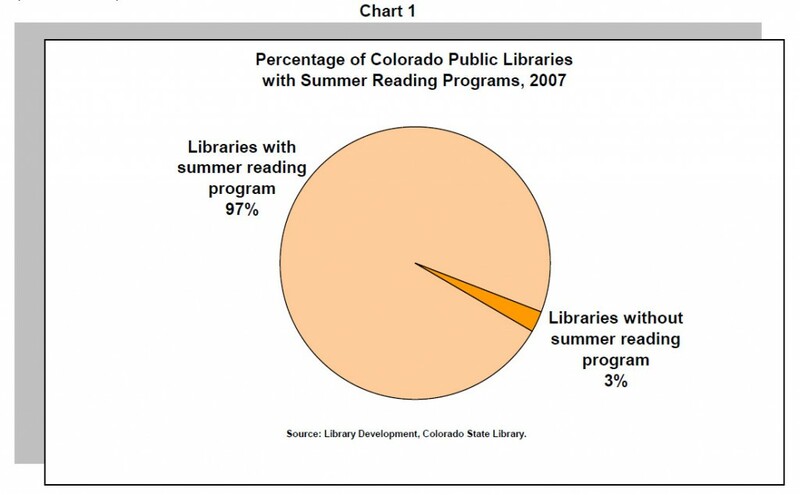 Last year (2007) in Colorado, 111 of the state’s 115 library jurisdictions (97%) reported implementing summer reading programs for their patrons (see Chart 1). For the 10 years from 1998 to 2007, there were a total of 1.5 million participants registered for summer reading programs in Colorado public libraries. In the last 10 years, Colorado experienced a 77 increase increase in summer reading registrants. In 2007, 97 percent of the state’s public libraries had a summer reading program. More than 8 of 10 Colorado public libraries used the 2007 Collaborative Summer Library Program theme and resources. Since 1999, the Library Research Service has collected information about the number of registrants in summer reading programs at Colorado public libraries. Reported data shows some 125,400 summer reading registrants in 1999 increasing nearly every year to 204,700 in 2007. 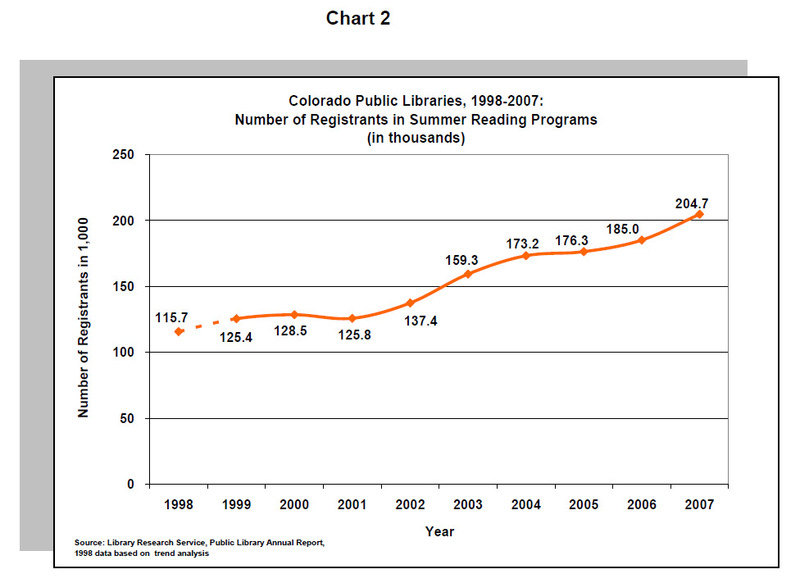 Using trend analysis to determine a 1998 estimated figure (see Chart 2), the data indicates Colorado experienced a 77 percent increase in summer reading registrants over the last decade; a significant rise in registrant numbers occurred during the later half of that time span. In total, some 1.5 million participants registered for summer reading programs at Colorado public libraries in the course of the 10 years spanning from 1998 to 2007. Most commonly, public libraries around the nation organize their summer reading programs’ promotional campaigns, reading lists, story time programs, special events, and reading incentive/giveaway materials around an overarching annual theme. However, the time, costs, and effort associated with successfully developing and implementing such a theme can frequently strain (or exceed) the resources of individual libraries. To address that need, a grassroots consortium, the Collaborative Summer Library Program (CSLP),3 took root as a multi-regional initiative within Minnesota in 1987. Today (21 years later), CSLP’s members include 46 states—represented by state agencies or associations—and 2 regional library systems. Together, consortium members select annual themes and work with vendors to produce related programmatic, promotional, and incentive materials on behalf of the entire collaborative. The dramatic growth of CSLP is indicative of the value its products and services have to libraries nationwide. Colorado joined CSLP in 2003 with the Colorado State Library as its member agency. Through a myriad of activities (see below), CSL works to help participating Colorado libraries successfully incorporate the CSLP annual theme. Particularly popular with small and medium-sized libraries, some 80-83 percent of Colorado’s libraries opted to use the CSLP theme during the past 3 years (see Table 1). Through its Statewide Summer Reading Program, the Colorado State Library currently works to assist all Colorado libraries with effective summer-reading program implementation. In addition to staff support and its role in CSLP, CSL allocates nearly $30,000 in LSTA funds each year for non-salary summer reading-related expenses, including approximately $10,000 in grants to libraries. Sixteen summer reading-focused training workshops reaching more than 415 attendees in locales around the state. The purchase and statewide dissemination of CSLP theme-oriented manuals and support materials—enough for all of Colorado’s 250 public library sites each year. 182 grants totaling nearly $29,000 in direct financial support to libraries throughout the state. In 2006, CSL became a partner in a 3-year Institute of Museum and Library Services National Leadership Grant research study4 entitled: “Do Public Library Summer Reading Programs Impact Student Achievement?” Participating sites in 8 states around the nation include Colorado’s Pueblo City Schools and the Pueblo City-County Library District. The data in this report clearly indicates that summer reading programs are attractive both to libraries and to their young patrons. Encouraged by library participation levels and the mutual benefits of collaboration, library agencies, leaders, and organizations virtually nationwide are cooperating to make such programs affordable to jurisdictions both large and small—and to further assess the benefits of such programming. The Colorado State Library continues to refine and enhance its leadership role in helping all Colorado public libraries and their patrons benefit from summer reading program experiences.